When it comes time to choose a retirement community for you or a loved one, there are many factors to consider. One of the most important is ensuring current health needs are met. You and your family also should look to the future and what it might hold. Will the community you choose be able meet future health needs? As seniors get older, their health needs change and become more complex. Therefore, it is always important to choose a retirement community that has a continuum of care already in place. Most seniors understand that as they get older, they will eventually need help with their daily activities like cooking and cleaning. To help with these needs, many of them look to moving to an assisted living community. However, some people move into assisted living well before they need to. If you are thinking about when to move into an assisted living community, here are a few advantages of moving in early. In your later years, you don’t want to spend all your time and energy dealing with daily chores. If you move into an assisted living community, you can pass those chores on to someone else to do. This will give you more time to enjoy your new community and your new friends. By moving into an assisted living community now instead of later, you can still maintain a huge part of your independence. This move is a life changing event no matter when you do it, so make the move when you are still independent. The move will feel less stressful because you are doing it when you want to, not when you need to. Many seniors who still live alone in their own home may feel bored or alone, especially if they can’t drive anymore and go out to different places like they used to. By moving into an assisted living community, a senior can get out without driving and meet other people. Assisted living communities have many fun activities like crafts, game nights, and movie nights. All you have to do is walk down the hall. Some seniors who live alone might be concerned about their security or the security of their property. Depending on the neighborhood you live in, this could be a very concerning issue. When a senior moves into an assisted living community it comes with its own sense of security. The community is staffed 24/7 , which tends to make a senior feel more secure, especially at night. By moving in before it is necessary, a senior can enjoy better security for themselves and their personal belongings. 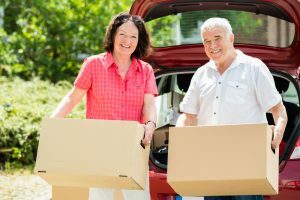 Even though leaving behind a home you have lived in most of your life can be stressful and bittersweet, many of today’s seniors report that moving into a retirement community was one of the best decisions they ever made. Social interaction, dining options, and access to on site healthcare services makes moving to a senior living community an easy choice.